The NBA Dunk Contest is Back! February 14, 2016 Mike NBA Comments Off on The NBA Dunk Contest is Back! Finally, the NBA Dunk Contest lived up to and exceeded the hype of what it used to be. 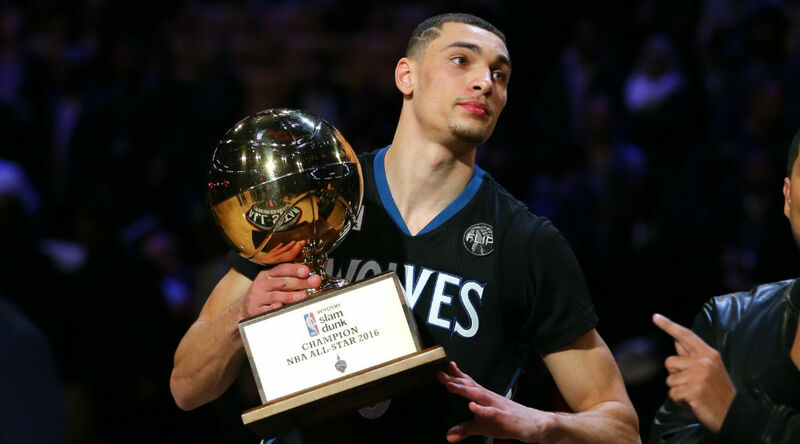 Zach LaVine, of the Minnesota Timberwolves, revived interest in the NBA dunk contest in 2015, with his incredible one-man show. That performance got people excited for the dunk contest this year, for the first time in a long time. And boy the 2016 Dunk Contest did not disappoint. Zach LaVine was more impressive this year, but this year he actually had a challenge. Aaron Gordon, of the Orlando Magic, went dunk for dunk with LaVine in arguably the best dunk contest ever. Just what the NBA needed. It’s worth your time to take 5 minutes and watch the battle. Many people say that Gordon was robbed and that he should have won the contest, I do agree that he had the single best dunk of the night. At the 2:30 mark above, the dunk when he jumps over the mascot in a sitting position while putting the ball under his legs, was the best dunk I’ve ever seen. The amount of athleticism needed to pull that off is incredible. I do think that LaVine’s body of work in the entire contest was better overall, but a co-champion scenario would have been perfectly fine with me. At the end of the day, the fans won because that was the most exciting back and forth dunk contest ever. Michael Jordan and Dominique Wilkins in 1988 was incredible, but this dunk contest offered more originality than that dunk contest had. Vince Carter was unbelievable in 2000, and probably the best single performance I’ve seen, but this dunk contest was better because we had two contestants going back and forth. And the single biggest part that goes overlooked in this contest that made it even better – Gordon and LaVine didn’t miss a single dunk in the Championship round. Dunks are so much more exciting when they land on the first try, you may remember, despite trying to forget, how sad the 2006 dunk contest was with Nate Robinson missing and missing and missing and miss… you get the idea, before finally landing his dunks. Brutal to watch. Now the NBA needs to find a way to ensure that LaVine and Gordon run it back next year. Next Post:The End of the Bench Mob?